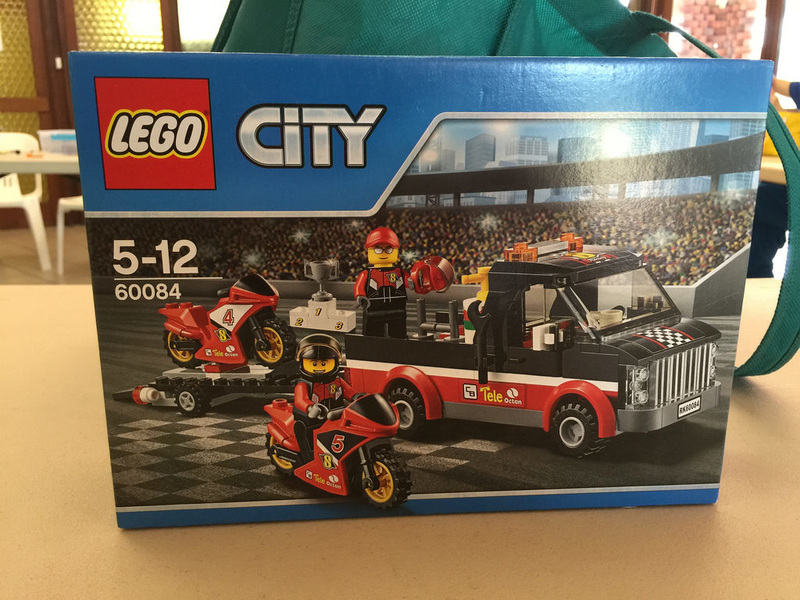 I’m a bit short of motorbikes in my collection, so when I saw this, I thought it was a good opportunity to buy some, plus it was a little cheaper, at $22. 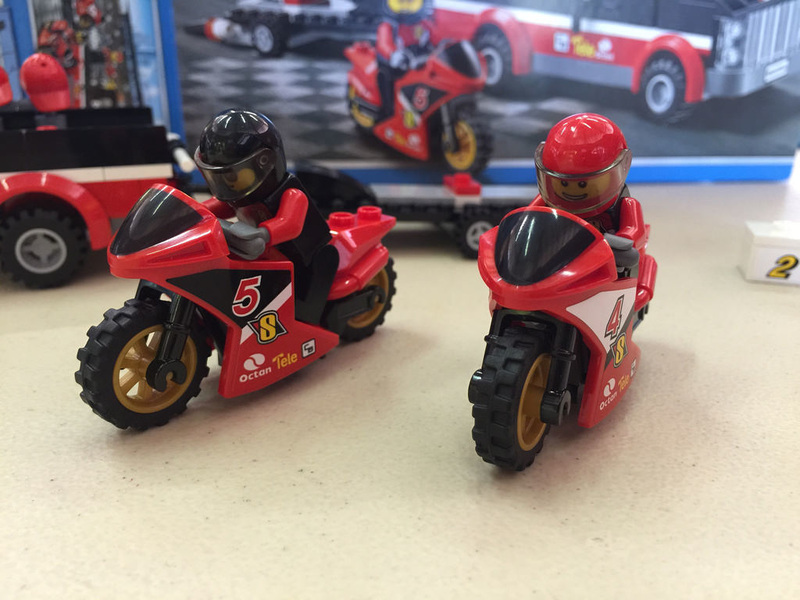 In addition to this, there are new moulds included, like the bikes! 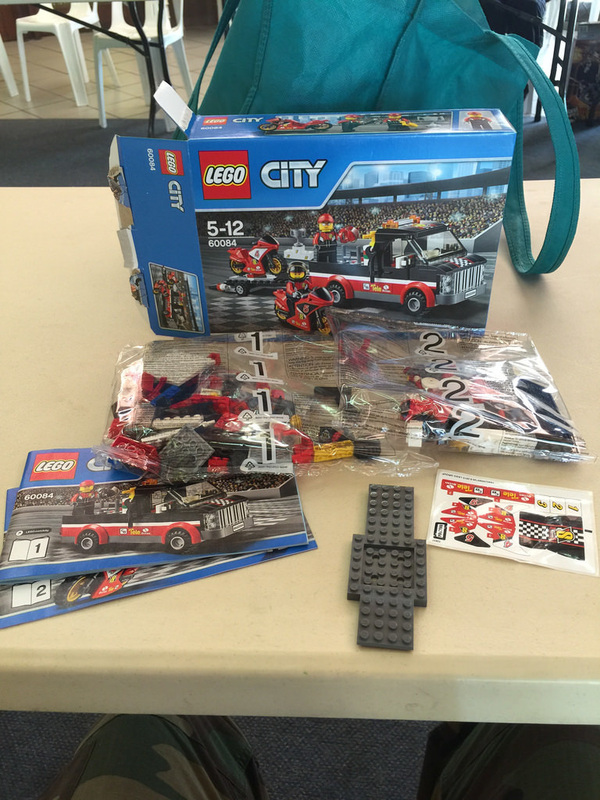 Out of the box are two parts bags, two instruction booklets, a sticker sheet with 12 stickers, and a loose car wheelbase. As always, let’s start with the parts. 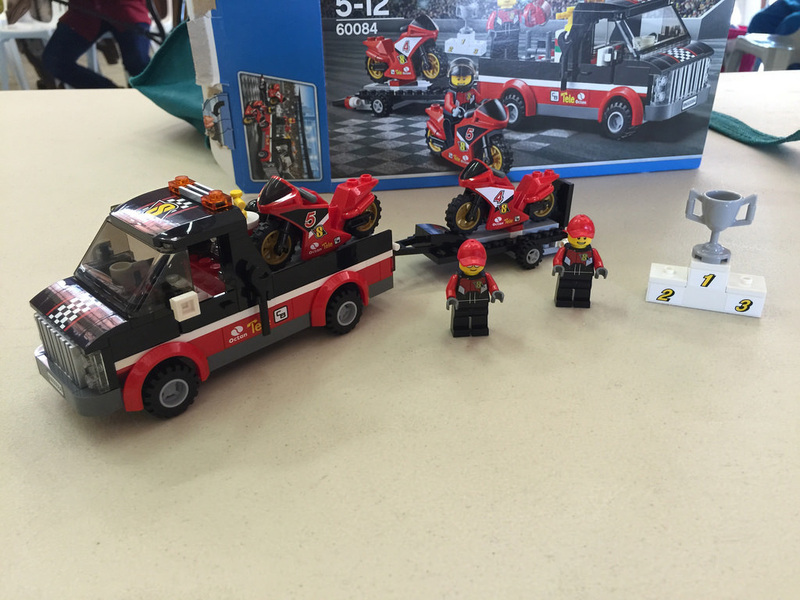 This set introduces a new motorcycle fairing! It’s pretty sleek and you get two of them. You’ll need to pair them with the new frame as well, as the old ones don’t fit with this frame. There are some pretty nice gold rims for the bikes as well, but the rest is pretty standard stuff. 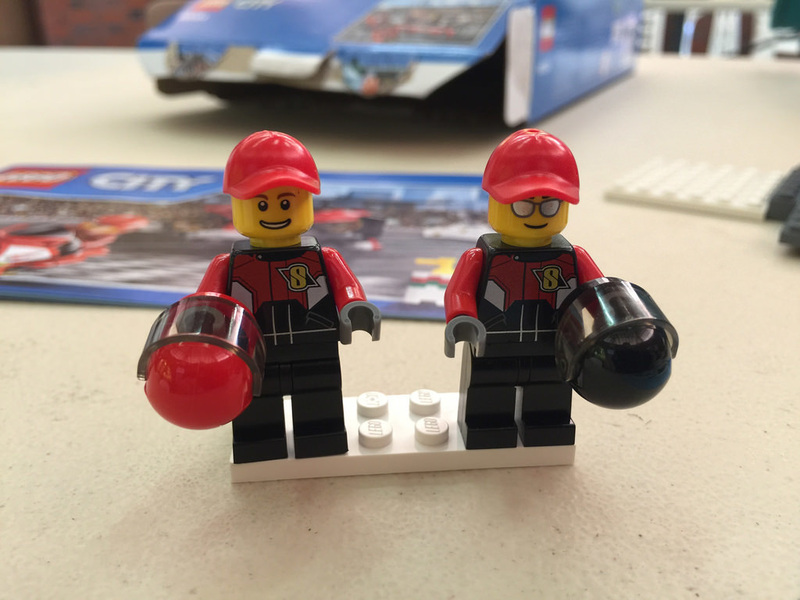 The minifigures are both in racing uniforms and black pants. It looks like they’ve got grey gloves on too. One has sunglasses, and one doesn’t, and both come with a red cap and black helmet. There’s some nice back prints on these guys too. The spares in this set are very minimal. 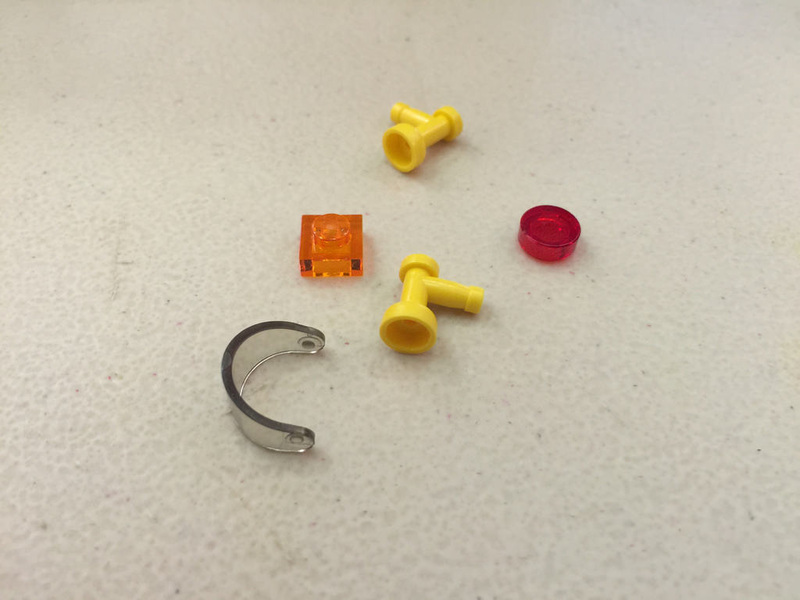 A visor, two yellow taps and some regular spares in the 1×1 range. The build is pretty quick, with the truck obviously taking up the majority of it. As usual, it’s a 6 stud wide vehicle, so there’s not much space. I like the back of it, but the front to me looks a little odd. With the tiny tyres, it just looks off. The tyres on the bike are bigger than those on the truck! The trailer looks good though. In addition, there’s a slide out ramp to get the bike on the back of the truck. This is a nice feature, especially for playability. There’s also room on the back for a fuel tank and a stand for the helmets. On top of all this is a winner’s podium and trophy. It’s a simple thing, but adds a little more playability. Overall, this is a pretty good set. Sure, the truck looks a little odd, but the new bikes make up for it. This set gets 7 out of 10 trophies. Next up on the review list will be my first Friends set! I’ve started buying these for the parts, so I thought I’d review my first one. It will be 41087: Bunny & Babies. I’ll be away for work for a couple of weeks from this weekend, so I may not be able to get posts up on a regular schedule, but I’ll try my hardest! 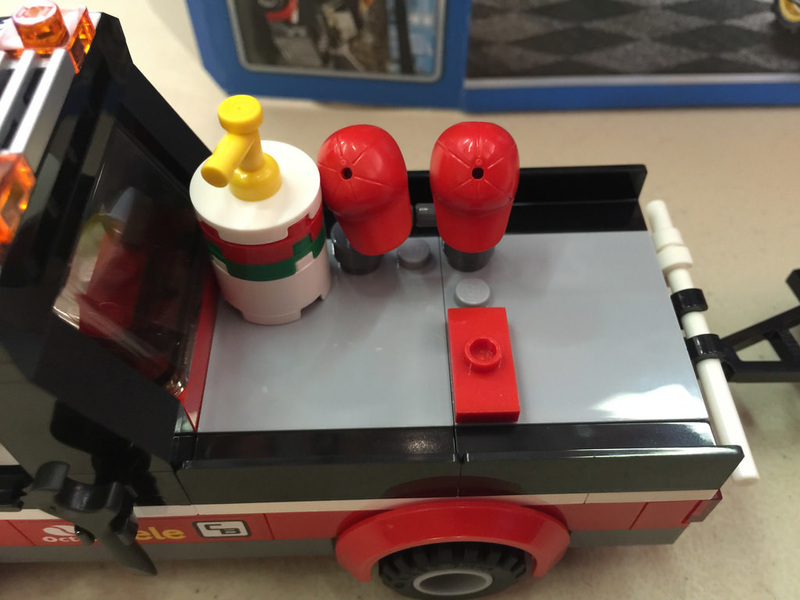 Don’t forget to like BricktasticBlog on Facebook, and leave a comment with your thoughts on this set!